Earlier this week I had the chance to testify in front of a joint committee of the Arkansas State Legislature focused on Public Retirement and Social Security Programs. I used the opportunity to show that Arkansas' current plan offers solid benefits to long-serving veteran teachers, but it can leave 5-, 10-, or even 20-year veterans with insufficient benefits. My full presentation is below. After defining an "adequate" savings threshold, I compare it to the current Arkansas Teacher Retirement System (ATRS) plan, as well as two other types of plans, a defined contribution plan currently offered to employees at the University of Arkansas and a cash balance plan currently offered to retirees in the ATRS system. As I show in the slides, the current ATRS plan has sufficient contributions going into it, and it does provide adequate benefits to workers who stay in the system for their full career, but that leaves many public school teachers without adequate retirement savings. The majority of Arkansas teachers will need to make up the gap somehow, by saving more in other jobs, working longer, or suffering from a less-than-adequate retirement. In contrast, other types of plans could provide more Arkansas public school teachers with adequate retirement savings regardless of how long they stay. For more info on Arkansas' teacher pension plan, see our review of key data points here or visit the plan's website here. While I was in Arkansas this week, I estimated that two-thirds of the state's teachers won't work long enough to qualify for adequate retirement benefits. Despite basing my estimates on the state pension plan's own actuarial assumptions, some legislators and audience members pushed back, arguing that the pension plan itself helps keep turnover down. As we've written before, the evidence does not support this argument, at least not for workers of all ages and experience levels. But the Arkansas data provide a few more reasons to doubt how much pension plans affect retention rates. This may be contrary to public perception, but the Arkansas pension system at least is seeing lower rates of turnover than it did 10 years ago. These forecasts are based on historical data and are used in the state's official financial projections. The state's assumed teacher retention rates climbed 9 percentage points (about 17 percent) during the last decade, at a time when the pension plan benefits stayed more or less the same. To put a finer point on it, just 23 percent of Arkansas school support workers stay long enough to qualify for any pension at all. They're paying into the pension system, and their employer is contributing on their behalf, but they'll never get anything out of it. Again, the pension plan stayed the exact same throughout this time period, and it was the same pension plan for school support employees as it was for teachers. Third, I also looked at the assumed retention rates used by the Arkansas Public Employees Retirement System (APERS). In benefit terms, the ATRS and APERS plans are extremely similar, except that APERS covers state and local government employees. For those workers, APERS assumes a five-year survival rate of 27 percent, and it hasn't changed this assumption in the last 10 years. Now, none of this proves pension plans do or do not have an effect on retention. That would require a much more rigorous study than the superficial look I've presented here. It's possible that pension plans do exert some retention effects on certain groups of teachers, but that those effects are being swamped by other factors like salary or working conditions. But neither of the Arkansas plans assume that workers change their behavior around the vesting period in order to qualify for a pension. And Arkansas' diverging trends do suggest that pension plans are not enough to protect against fluctuations in retention rates over time, or against some groups of workers having much higher or lower retention rates even in the same pension plan. *Note: Throughout this post, I use the state's turnover estimates for females. The rates for men are even higher. The following piece originally appeared on The 74. For nine days, West Virginia teachers went out on strike over concerns about salaries and health care benefits. Much of the press coverage on the strike has focused on West Virginia’s low ranking in average teacher salaries (see examples from The New York Times, USA Today, The Washington Post, CNN, Vox, etc.). Although it’s true that West Virginia has low average salaries, this statistic misses out on lots of other things. 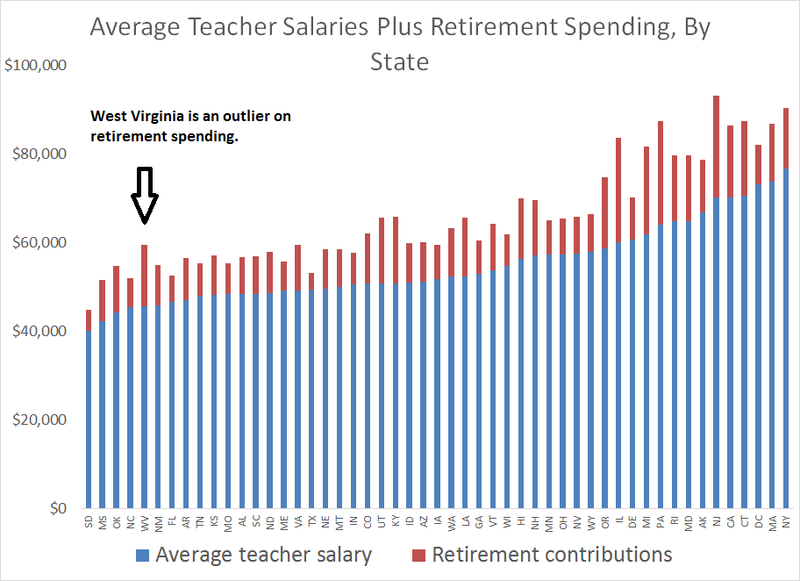 For example, I’ve written before about how growing retirement costs are eating into teacher salaries, and it turns out West Virginia is a prime example of this. Overall, West Virginia climbs to 32nd in terms of salary plus retirement costs. That’s a very different story than the one being told by the media. Of course, this also doesn’t get into cost of living. West Virginia lands in the middle of the pack on cost of living, and if we adjusted the raw salary figures based on how far $1 would go, West Virginia teacher salaries would rank even higher. None of this is to make a judgment about how much West Virginia teachers should be paid, but that argument shouldn’t hinge on the “average teacher salary” metric. Without looking at all forms of compensation or adjusting for cost of living, average teacher salary rankings don’t tell us all that much. Amidst the strikes and protests about state education funding and teacher pay, the problem of rising benefit costs, such as pensions and healthcare, went largely unnoticed. That’s a mistake because spending on benefits affects how much money gets to the classroom and influences teacher pay. In a new report, I look into just how much spending on benefits has changed at the district-level between 2005 and 2014. The results are troubling. The trend of benefits eating up a growing share of K-12 budgets is consistent across the country but varies significantly from state-to-state. In West Virginia, for example, 25 percent of K-12 spending goes to benefits. Once changes to states’ overall investment in K-12 education are taken into account, 23 states actually sent fewer dollars to the classroom in 2014 than they did in 2005 after adjusting for inflation. For instance, North Carolina increased its education budget by 2 percent, but its benefit spending rocketed up by 48 percent. As a result, the state actually sends approximately $589 million less into classrooms. 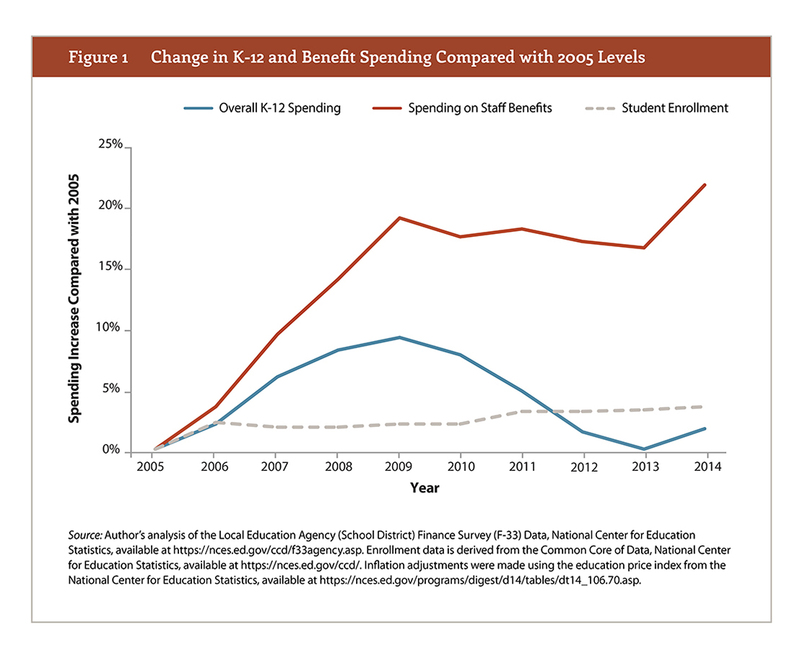 Rising benefit costs is a problem for educators and policymakers alike. For teachers, much of the rising costs go to pay down debts and thus actually don’t correspond with more valuable pensions or better medical benefits. And worse, without similarly rising overall K-12 spending, fewer dollars are actually spent in the classroom. For state legislatures, the growing benefit costs squeeze budgets. To actually increase K-12 spending, states need to growth their investments more significantly than they have in the past. This problem likely will get worse before it gets better and should worry educators and legislators alike. There are no easy fixes to these problems, but it will be critical for legislators to find solutions that balance past paying down past obligations with contributing to the education of current students. Stagnant teacher salaries have been a source of political consternation in recent months. Striking teachers in five states have pointed to low salaries as a key reason for walking out. Meanwhile, Los Angeles teachers are threatening to strike as well, and Miami voters will be deciding on a big increase for teacher salaries this fall. While teachers make less money than similarly educated professionals in other fields, another claim often made by teachers is that their salaries have seen no improvement over the last few decades. They point to average teacher salaries, which have declined by $630 in real dollars since 1991, to bolster their claims. However, average teacher salaries alone do not tell the full story of what’s happening to teacher compensation. Chad Aldeman explains this concept in more detail here, but to summarize, declining average teacher salaries may reflect changes in teacher cohorts rather than an actual decline in compensation for teachers at any given point in their career. Young, newly-hired teachers are paid less than experienced teachers. For this reason, if one experienced teacher retires and is replaced by a first-time teacher being paid an entry-level salary, average teacher salary declines despite the fact that no teacher’s pay was cut. This means that lower average teacher salaries don’t necessarily indicate worsening conditions for teachers. Instead, they could indicate that the profession has become more mobile. Another way of looking at teacher compensation can be found in state teacher pension plans’ actuarial valuations. These publications include a list of assumptions used to estimate the plan’s future payouts, including assumptions for teacher salary growth rates. 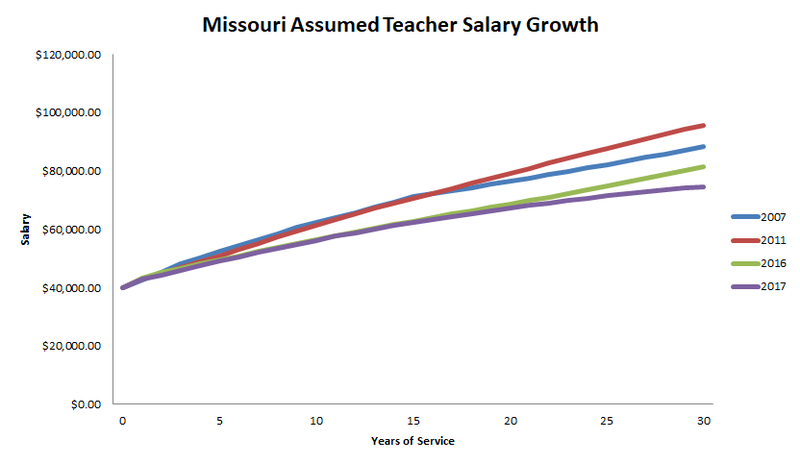 These assumptions are compiled through regular observations of what’s happening in the state, meaning that the salary growth rates should closely mirror the actual experiences of teachers at the time. These salary growth rate assumptions can tell us a lot about how teacher compensation has changed over time. If the growth rates are going down, that means that teachers’ salaries are not growing at the same pace as they used to, bolstering claims that teachers are losing out. So, do these salary growth rates tell the same story as declining average teacher salaries? Unfortunately, the overall answer appears to be yes. Not all states report the data every year or keep their reports online, but we took a random sample of five states (Arkansas, Connecticut, Michigan, Missouri, and Texas) with actuarial data going back to at least the mid-2000s. Each state’s nominal salary increase assumptions demonstrated a marked decline, and four out of five states saw decreases in real growth rates as well. In Arkansas, a teacher who began her career with a salary of $40,000 in 2004 would have been expected to make $95,824 after 30 years. Today, she would be expected to make $79,384. In Michigan, a teacher who began her career with a salary of $40,000 in 2002 would have been expected to make $143,676 after 30 years. Today, she would be expected to make $140,272. In Missouri, a teacher who began her career with a salary of $40,000 in 2007 would have been expected to make $88,361 after 30 years. Today, she would be expected to make $74,648. There’s one big caveat here: we don’t know how average starting salaries have changed over this timeframe. Even if salary growth rates are decreasing, it’s possible (although unlikely) that a large simultaneous rise in average starting salary could mitigate the slower growth. That being said, there’s reason to believe that these declines really do signal a worsening of teacher pay. For one, it corroborates what we're seeing in the trends in average teacher salaries. In addition, despite education budgets increasing in many states over the last decade, these declines in salary growth are coming at the same time that benefit costs are ballooning massively, eating more and more into the money that could be available for teacher salaries. As contributions to unsustainable teacher pension and health benefit plans continue to rise, many cash-strapped municipalities are facing impossible choices between paying teachers what they deserve or maintaining adequate funding of other core services. Sadly, it’s hard to see these declines reversing themselves in the near future. Benefit spending will continue to ramp up over the next few years in most states. And if teacher salaries have declined throughout a period of economic expansion, it’s frightening to imagine what might happen if another recession hits and budgets are slashed. Nevertheless, we owe it to our teachers—and our students—to find the money to ensure that teachers are compensated in ways that fully reflect their worth and skill. *Years vary based on data availability and when the states updated their assumptions. **Although Connecticut’s nominal salary growth rates have declined, the state lowered their inflation assumption from 4% to 2.75% over the same time period. For this reason, assumed real salary growth is higher today than it was in the mid-2000s. ***Texas reports separate salary increase assumptions for men and women until 2008. The pay growth rate used in 2006 is for women only and is slightly lower than the growth rate for men. This means that the fall in average salary increase over this time period is actually slightly greater than what is reported above.